The Spellbinders Heirloom Ornament Tutorial is yet another idea that you can adapt for your Christmas Decorations ... but it can also be adapted for any occasion where you may need something Special. Do you like to add decorations to your home and you are sometimes stuck for ideas? 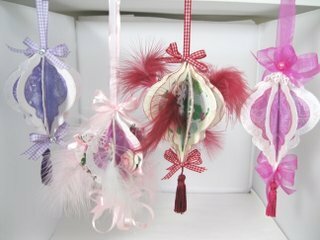 Well here is another tutorial on how to create more pretty ornaments in time for Christmas or any other celebration you may have. Here is another idea you may like to try. They are all very easy to make and can be adapted for any occasion... one of mine is for a summer event but they would be excellent for a wedding too. The video is not long but will take you step by step through what you need to do to create this look for your self. And the added "Bling" is from Want2Scrap and is the perfect embellishment to any card. But although I have used this particular die for my ornaments don't be afraid to experiment with any shape that you have in your personal collection of dies. This method would work just as good with Scalloped Circles for the outside and plain circle for the centres. And very shortly I will be adding another video that will make your square dies work just as well for this kind of decoration too. All you need to do is play and experiment and make these dies work for you ... and look at them closely for ideas using them outside the original thought for every single die that you own. So this Spellbinders Heirloom Ornament Tutorial will help to expand your repertoire a little bit more and give you something pretty to hang in your home this year.